A Bedfordshire golf academy is taking big strides to bring the sport to Luton’s Asian and eastern European communities. The Kevin Duggan Academy at Stockwood Park Golf Centre has obtained a grant from the Ryder Cup European Development Trust (RCEDT) to help target sections of the town where golf is not readily accessible. And Dan Fitzsimmons, a PGA Advanced Professional at Old Fold Manor, and academy founder, Declan Duggan, have been instrumental in the project which got underway in the first week of June. 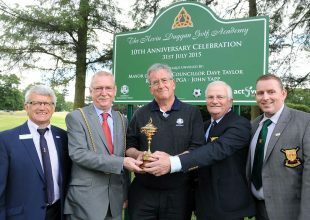 “We have been involved in on-going talks with the Asian elders and the idea is to provide an opportunity for kids to try golf using the facilities at Stockwood Park,” explained Fitzsimmons who is a trustee of the academy set up by Declan Duggan in memory of his son who was killed in a drink-driving accident. “Most of the schools don’t have budget to fund coaching in the curriculum so we are transporting the kids to have free coaching at the Academy. “We’ve identified 200 children and PGA pro Doug Henderson will deliver the sessions while another PGA pro Simon Wagstaff specializes in blind golf coaching. Simon has also introduced golf to a local hospice in Luton. The golf academy is widely used by both underprivileged and disadvantaged children, together with the general public. Declan Duggan set up the project to allow people who might not traditionally choose to participate in sport, let alone golf, to have the opportunity to have a go. PGA chief executive Sandy Jones officially opened the academy in 2005, along with David Blunkett, the former Home Secretary. 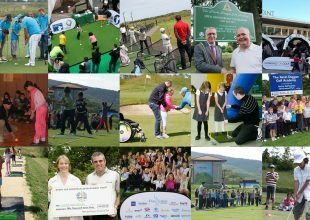 The RCEDT was set up in order to support golf at grass roots level throughout Europe. The idea of the Trust is to get more people starting to play golf, continuing to play and ultimately succeeding in the game. For more information about RCEDT click here while further information on the Kevin Duggan Golf Academy is available here.